Basically, we get five products from this process. We get raw cacao beans, and because we've disinfected and washed them you can eat them - raw! We get raw cacao nibs, which are the beans without the skin. We get raw cacao liquor, which is the nibs ground into a paste. Then when we take the the liquor and put it into a very high-pressure press, which presses all the fat and butter out of it. So the end product is the raw cacao butter and then this hard cake that's milled into raw cacao powder. 1kg of liquor is about 50% fat, so when you press the liquor you get about 40% cacao butter and 60% powder. The powder retains about 10% fat content after pressing, and all the antioxidants plus a lot of the nutrients are concentrated in that powder. 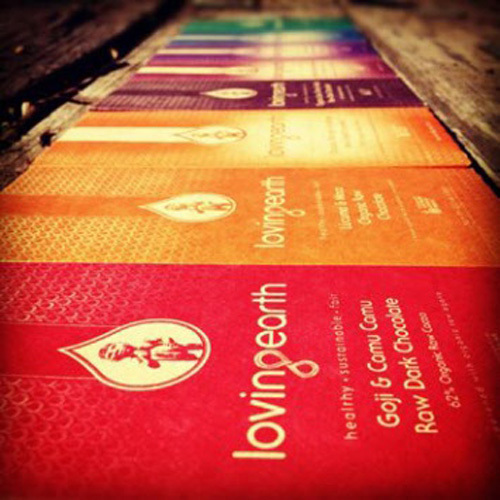 Every Loving Earth chocolate bar comes to you in a plant-based inner wrapper to maximise freshness and extend shelf life. These wrappers are not made of plastic, so please recycle them! The boxes which contain our wrapped chocolate bars are made from 80% recycled post-consumer cardboard and are printed with vegetable inks. 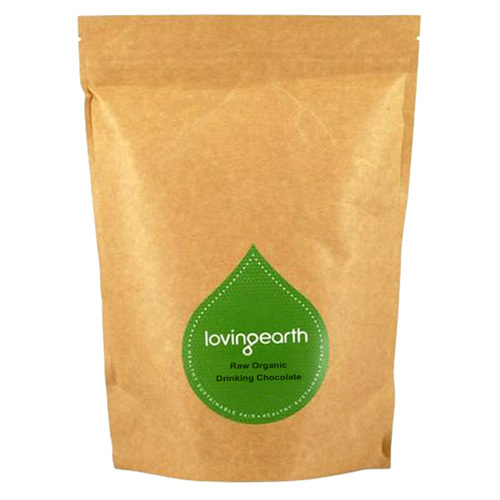 Loving Earth chocolate is made with raw Cacao. This means our chocolate has up to twice as may antioxidants as conventional chocolate. We use organic evaporated coconut nectar (a natural, low GI sweetener) instead of cane sugar or agave syrup to create this delicious chocolate bar. Per serve - 8.9g: Energy: 221KJ (52Kcal). Protein: 0.9g. Total Fat: 4.0g. Saturated Fat: 2.2g. Carbohydrate: 3.5g. Sugar: 1.3g. Sodium: 2mg. Per 100g: Energy: 2490KJ (593Kcal). Protein: 10.1g. Total Fat: 45.1g. Saturated Fat: 24.8g. Carbohydrate: 38.8g. Sugar: 15.0g. Sodium: 19mg. Per serve: 8.9g: Energy: 199KJ (47Kcal). Protein: 0.9g. Total Fat: 3.0g. Saturated Fat: 1.6g. Carbohydrate: 4.5g. Sugar: 2.5g. Sodium: 2mg. 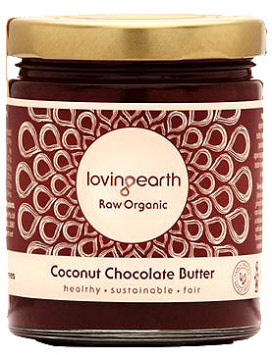 Ingredients: Organic Raw Cacao Butter, Organic Evaporated Coconut Nectar, Organic Coconut, Organic Cashews. Our Salted Caramel Chocolate is made by blending Amazonico Criollo, Certified Organic, Raw Cacao (35%) from Satipo, Peru, Raw Cashews, Organic Evaporated Coconut Nectar and a pinch of Pink Lake salt, sourced locally from Western Victoria. A recipe that is sure to hit all the taste buds - this is the salty sibling of our popular Caramel Chocolate! We have created this bar by blending Raw Cacao Butter, Creamy Raw Cashews, Coconut, Evaporated Coconut Nectar and a pinch of Pink Lake salt. 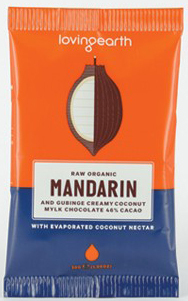 The Raw Cacao Butter and Raw Cashews used to make this chocolate are Fair Trade Certified. We also support the Criollo community by helping them add as much value as possible to raw materials at the point of origin. 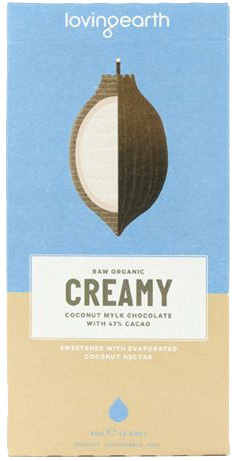 Thi s Creamy Coconut Mylk Chocolate is made with Amazonico Criollo, Certified Organic Raw Cacao (47%) from Satipo, Peru, Organic Coconut and sweetened with Organic Evaporated Coconut Nectar. How to use: Our Luvju makes for a deliciously healthy snack at any time of the day. 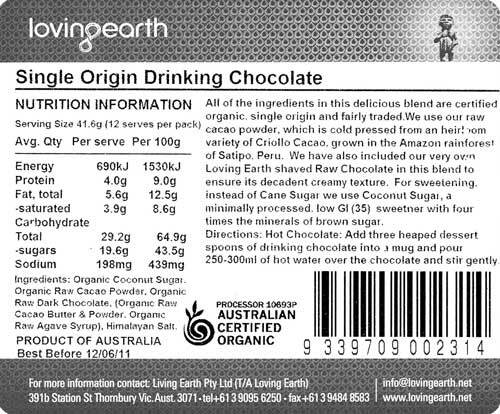 Loving Earth's Single Origin Drinking Chocolate is a rich, decadent chocolatey treat! It blends easily into warm water and makes instant hot chocolate easy and nutritious. texture. For sweetening instead of cane sugar we use Coconut Sugar, a minimally processed, low GI (35) sweetener with four times the minerals of brown sugar. For a decadent rich hot chocolate: Add three heaped dessertspoons of drinking chocolate into a cup and pour 250-300ml of hot water over the chocolate and stir gently. 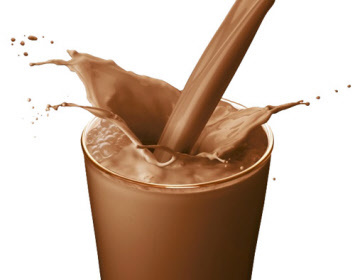 For an iced chocolate: Blend 3 heaped dessertspoons with 1 cup of ice and 1 cup of water in a blender until smooth. Organic coconut sugar, organic raw cacao powder, organic raw dark chocolate (organic raw cacao butter & powder, organic raw light agave syrup), himalayan salt. 2005, 248 pgs., softcover, full-color photographs throughout the entire book. Finally, the truth about chocolate! 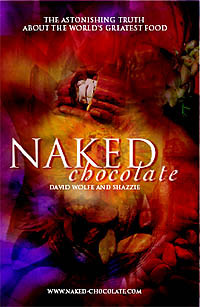 No expense was spared to bring you Naked Chocolate, an extraordinary raw foods / superfoods book. Naked Chocolate is the product of years of research into superfood nutrition. Absolutely stunning full-color presentation. Yes, raw, organic chocolate is good for you. In fact, David Wolfe and Shazzie demonstrate it is the best food ever. In these pages, you will discover the astonishing truth about the world's greatest food. Chocolate grows on trees! All chocolate comes from cacao beans - the seeds of the cacao fruit, which grows on a jungle tree. Cacao beans taste like dark chocolate, because they are dark chocolate! David Wolfe and Shazzie introduce the phenomenal, enlightening power of cacao beans engulfed in the magic of chocolate! And they show us how to use extraordinary chocolate recipes to achieve higher and higher states of pure joy! Naked Chocolate contains over 60 original, enticing, mouthwatering chocolate recipes. The recipes in these pages allow you to find that perfect alchemical potion that causes all heaven to break loose. Warning: Reading this book may cause you to have the best day ever!